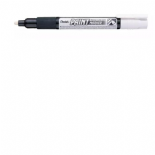 Pentel MMP20 paint marker pens are cellulose based paint markers that are extremely versatile and easy to use. The pentel MMP20 paint marker has a 4mm bullet tip and can be used on glass, stone, metal, plastic, thick card and lots of other surfaces. They are available in 15 different colours which you can buy singlely or in one of the fantastic packs we have put together.